I have been slammed at work recently. Either I have become less efficient, more important, or I’ve recently traveled from my happy little fantasy land to reality. My bet is on the last option. There are some excellent projects we’ve been working on here at the Main Street Guymon office. Fund raising efforts are at an all – time high. Mark June 30 for the Main Street Taco Dinner and Bingo Evening at the No Man’s Land Center at 5:30 pm. The tacos are served at 5:30 and Bingo begins at 6:30. The cost for a taco plate (that includes homemade salsa) is $7 and the cost for a bingo card is $1 per game. The prizes for the bingo winners is half of the pot collected. Sometimes that is paid in cash and sometimes it is paid in Main Bucks, which can be spent at 30 different Main Street Guymon member businesses. We’re asking for hamburger, homemade salsa, and dessert donations. Feeling helpful? On July 21 is Main Streets first Wit and Wisdom Talk Series, another fund raiser for our Main Street programs. John Board is going to give the talk and the dinner is catered by Virgil Gibson. It is $20 a person and it all happens at Pioneer Hall (next to St. Stephen’s Episcopal Church) at 1803 N Lelia. This begins at 5:30 pm. Working on these makes me recall, “The light at the end of the tunnel has been turned off due to budget cuts.” How sad. Support our Main Street fund raisers so our light isn’t turned off! Take a gander to the YMCA at 1602 N Oklahoma on June 26th from 5:00 – 6:00 pm and register for a chance to win $100 in Main Bucks. 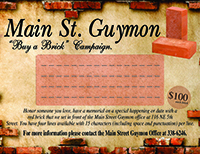 That’s $100 you can spend at any of 30 different Main Street Guymon member businesses. You might find yourself taking home some other goodies that encourage you to have a healthier lifestyle. I think I would be healthier with $100 in Main Bucks! At a recent drawing by the OPSU Business Club, Mary Blagg won a basket of Main Street member items (gift cards, items, etc.) and $440 in Main Bucks. And Mary hadn’t even bought a ticket! I’ll tell you the secret. Sometimes if you really want to feel good, buy tickets for some drawing and write down names of people who help you out, who are there when you need a helping hand, a smile, or an encouraging word. I’m here to tell you, it feels great and you’re the only who knows you did it so it doesn’t even inflate your ego any, which goes to making you insufferable. THEN if one of them wins, it is like a warm and fuzzy all over. But sometimes you have to explain because the winner doesn’t see how they can win a drawing they didn’t buy a ticket for. And sometimes you tell about it in the newspaper and that inflates your ego. Am I insufferable yet? If not, I’ll just work on it a little more and we’ll be there. We need to value other people’s efforts more. We want to be valued and that doesn’t start until we do the same for others. Send a card to someone that is deserving. Take some flowers by someone that makes you grin. Share your appreciation of something someone has done. Make the world a happier place. Go forth and be someone who gets a good reference.